With its compact size, 8 GB of internal storage, and long battery, life this digital music player keeps you entertained with music and photos on the go! 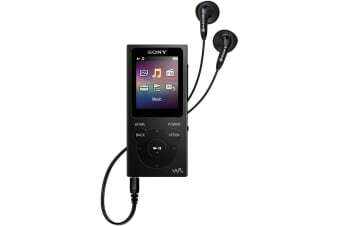 Just drag and drop to transfer your favourite music, videos and photos to the Sony E Series MP3 Digital Walkman and stay entertained while you’re on the go! Thanks to the built-in FM radio you can also quickly switch to FM when you’ve had enough of your digital music. With an excellent battery life of up to 35 hours, this music player can deliver Sony-quality sound all day long!